The IFC Seoul Office Tower buildings in Yeouido will open this week amid attention from the real estate industry over whether it will serve as a landmark in the financial district in Seoul. The IFC compex is composed of four buildings. They are the 32-story One IFC Seoul Office Tower, the 29-story Two IFC Seoul Office Tower, the 55-story Three IFC Seoul Office Tower and the 38-story hotel Conrad Seoul with 434 guest rooms. There will be an underground 3-story IFC Mall in the complex. GS Engineering and Construction Co. built the buildings. Rent operation for the Two IFC Seoul Office Tower and the Three IFC Seoul Office Tower are promising, its developer said. “We are accepting tenant business companies for Two IFC in advance so that we can focus on Three IFC Office Tower soon enough,” an official of AIG Global Real Estate, the official developer of the IFC project, was quoted as saying. “And the 55-story Three IFC Office Tower will become the landmark of the area,” he said. The company said that it has already signed a number of contracts with companies including some foreign firms that will be moving into Three IFC Office Tower as well. According to the developer AIG, the rent in office towers Two and Three will be set at approximately 85 percent to 90 percent of the price of the Seoul Finance Center in Gwanghwamun, or SFC. Real estate experts estimate that the final rent will be close to those of SFC and One IFC Seoul Office Tower. For every 3.3 square meters, the deposit money for SFC units is about 1.25 million won ($1,100) and 169,000 won ($150) for maintenance fees and rent. One unit in IFC Seoul Office Tower costs about 1.05 million won for the deposit and 145,000 won for maintenance and rent per 3.3 square meters, they said. AIG added that tenants will begin moving into the two newly built office towers starting in November, once GS Engineering and Construction Co. completes the post-construction process. 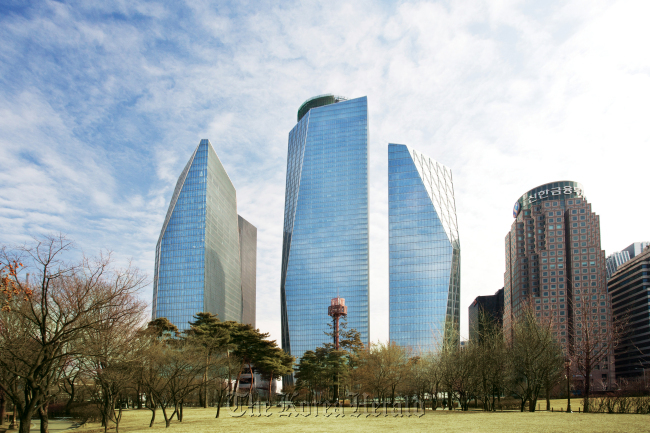 One IFC Seoul Office Tower began accepting tenants in October 2011, hosting foreign financing and consulting firms such as Deloitte Korea, ING Investment Management Korea and the Bank of New York Mellon. Korean financing and non-financing firms, including Samsung Securities Co. and LG Chem Ltd., have also moved into One IFC Seoul Office Tower. Other IFC Seoul projects are also in the works, with the IFC Mall planned to open a day earlier, on Aug. 30.